Honey is unique among foods. It nourishes and heals but cannot spoil. This concentrated nectar of flowers tastes of the blooms in season. 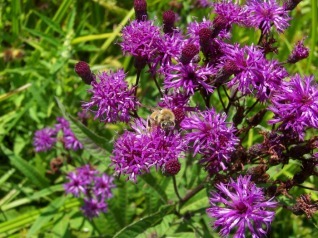 On our farm the beehives are near blackberry bushes, clover, apple trees and wildflowers. We leave our honey raw. Store-bought honey is industrially heated and may be adulterated. Raw honey retains all vitamins, minerals and enzymes intact for the best flavor and the greatest impact on your health. We call our honey organically hived because no medications, chemicals, or supplements are ever used in or around the bee hives. (Our honey is not certified organic. We hope to be able to afford certification in the future.) 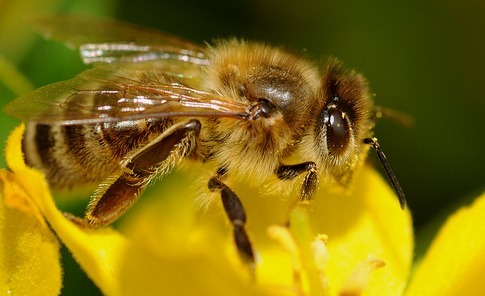 The majority of U.S. beekeepers use chemicals in the beehives to manage pests and diseases. 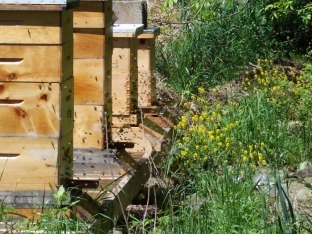 And nearly all beekeepers feed their bees a corn syrup solution to replace harvested honey. But here at Bit of Earth Farm we rely on healthy conditions and natural cycles to keep a half million Apis mellifera buzzing happily. We also offer honey in historic replica Muth jars, sealed with a cork and labeled with a hang tag. With any purchase of honey, we offer a reduced price of $10 on Tending, a poetry collection written here on Bit of Earth Farm (available on Amazon for $14). 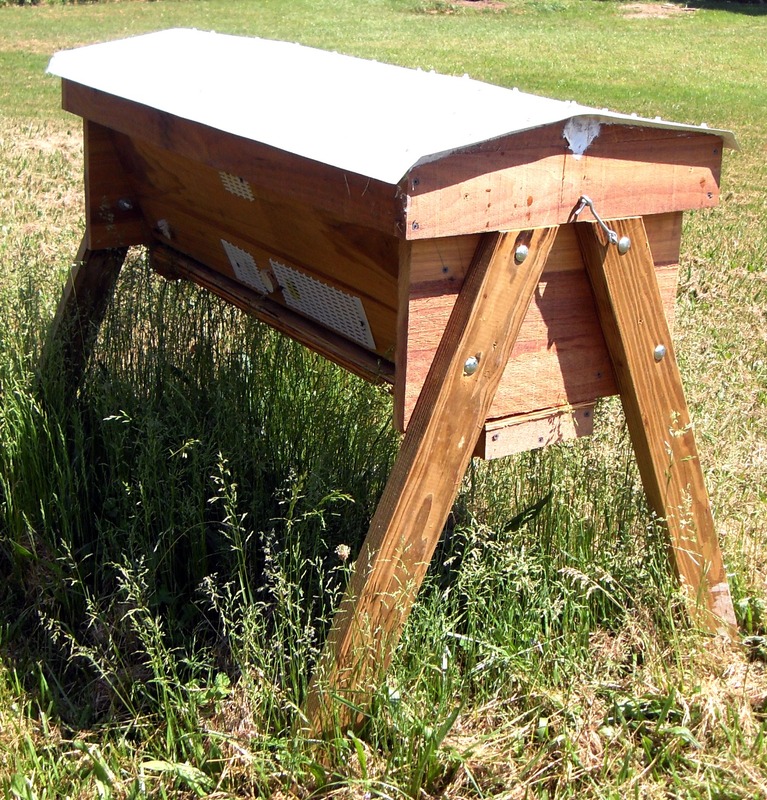 Learn here and here how we beekeepers can improve standards to help bees. ~Honey contains nutrients including riboflavin (vitamin B2), niacin (vitamin B3), pantothenic acid (vitamin B5), vitamin B6, folate (vitamin B9), vitamin C, calcium, iron, magnesium, phosphorus, potassium and zinc. It also contains antioxidants, some found only in honey, such as pinobanksin, chrysin, catalase and pinocembrin. ~Honey has a healthier glycemic index (GI) compared to sucrose, high fructose corn syrup and other common sweeteners. Its natural fruit sugars provide sustained energy. ~Honey boosts physical performance and endurance while also reducing muscle fatigue, according to a University of Memphis study. ~Honey can be an important part of a weight loss program. ~Honey has antioxidant and anti-bacterial properties that aid the digestive system. It has been shown to soothe disorders such as indigestion and constipation. Clinical studies have also found it can accelerate the healing of gastrointestinal ulcers. ~Honey is an effective treatment for sore throats due to its antimicrobial properties. It eases discomfort and also kills bacteria causing infection. ~Honey is a more effective cough remedy than leading medications, according to researchers at the Penn State College of Medicine. Honey offered the greatest relief, even compared to the leading cough-suppressant found in over-the-counter cough and cold medications. ~Honey, particularly locally sourced, is helpful in preventing allergies and hay fever. 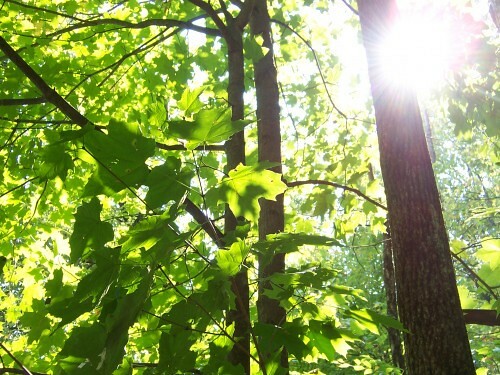 It’s thought that it helps the body to deal with the pollen of area plants. 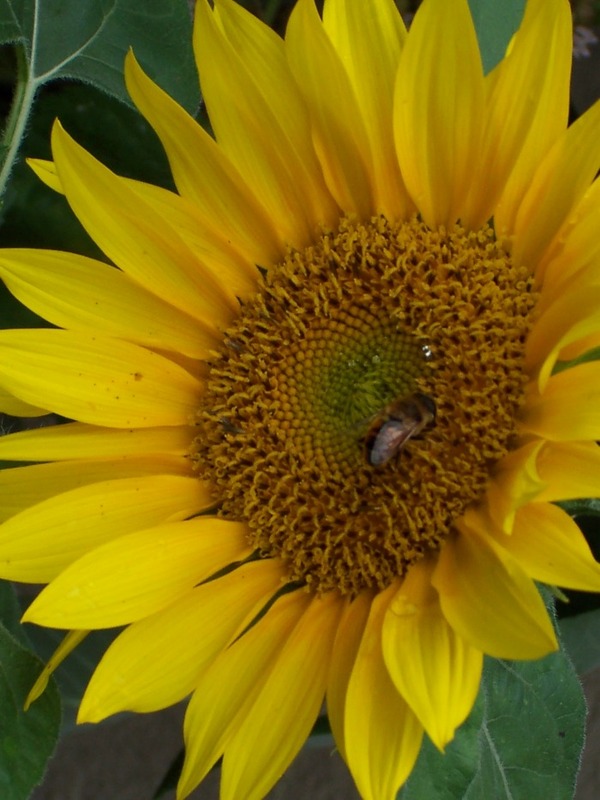 ~Honey has proven effective for treating respiratory ailments. A Bulgarian study of almost 18,000 patients found that it improved chronic bronchitis, asthmatic bronchitis, chronic and allergic rhinitis and sinusitis, colds, flu and other respiratory infections. ~Honey increases the body’s ability to absorb and utilize calcium. ~Honey can increase hemoglobin count. It can also help to prevent anemia. ~Honey has been repeatedly shown in clinical observations and research to provide extraordinary levels of antibacterial and anti-inflammatory protection. It accelerates healing by reducing inflammation, inhibiting the growth of bacteria, keeping wounds clean, and destroying free radicals. Studies show honey is more effective in controlling infection in burns than the product most often used in hospitals. Research has demonstrated that honey outperforms antibiotics in treating surgical infections, skin grafts, wounds, impetigo, even gangrene.